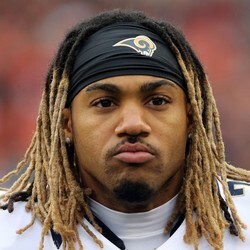 The Palm Beach Post reports Los Angeles Rams running back Tre Mason was arrested Tuesday night for "driving recklessly" in a park near Boynton Beach and "fleeing" from a Palm Beach County deputy on an ATV on July 27, 2016. After probable cause for his arrest was filed in August, a warrant was issued on Dec. 15, 2016, which ultimately led to Mason's Tuesday night capture. Mason is in the midst of a downward spiral in his life, and in his NFL career. It began during the 2016 offseason in which he had multiple altercations with the police, he exhibited erratic behavior and was a no show for the Rams' offseason workouts and training camp. He hasn't played an NFL down since the 2015 season. Although he is under contract with Los Angeles until 2018, it is a long-shot that he plays this season as he is facing disciplinary action from the NFL stemming from his behavior, which violates league policies. Mason's professional career moving forward is up in the air.